Dr. Jones: Hobbies, oh my. When I was very young I actually collected stamps because my dad did, but as I got older that kind of faded. That was cool, though, because I knew all these places around the world. Once I got to be in middle and high school, I got into basketball and then nothing else mattered, that was it. I was not into anything else. I wasn’t in band; I wasn’t an artist; I didn’t do chess club. I didn’t do anything, just played basketball. Renée: Did you play ball in college? Dr. Jones: I did, which at least I got something out of it. I mean, I was good at school, so it wasn’t like I didn’t do that. Dr. Jones: We do! We have a dog named Mabel. [pulls out his phone to show a picture] Many of my students are fond of her even though they’ve never met her. I am not a technology person either, so I’m shocked to find I have about five pictures of Mabel. She’s part beagle and it’s-hard-to-know-what-else. Renée: If you email me the photo of her, I will put it in the article. Dr. Jones: She’ll get in the paper? Oh! That would be big; she would love that. What is a life lesson that has made an impact on you? Dr. Jones: Hm… [laughs] just one? Yikes, so many things. I think growing up, one thing I did not understand at all is that people are highly interconnected. You’ll hear this – and my students are sick of hearing this – we’re not little individuals the way many of us, especially if you were raised in the United States, think. We are so interconnected with other people we don’t even recognize or understand it. When I was younger, I did not understand it, [but] as I got older I began to understand it more. Then I started to study and I was like [raises arms in exclamation] ‘what was I thinking?’ But if you’re looking for something short and pithy then… it’s always better to run towards something than away. Dr. Jones: You know, growing up I would just listen to whatever is one the radio. I am so old that when I was young there wasn’t even FM radio. You’re probably thinking: is he lying to me? But there was a time when there was no FM radio. I listened to everything; back then, on AM stations, they would play Billy Joel and some pop – something really mainstream – then the next thing would be like Deep Purple or Led Zeppelin, and then they would go into Roberta Flack. They just played anything, like Barry Manilow or The Rolling Stones. If it was popular and people liked it, they would play it. Now I like to listen to what would be considered ‘classic rock,’ but back then it was just what was coming out. When I was playing basketball, I was around people who listened to different kinds of music. I got introduced, way back when it was just starting out, to the early rap, which was mind-boggling back then because it didn’t exist previous to that. It’s interesting to see how that has changed through the decades. If you could go back and witness an event in history, but you can’t change anything, where would you go? Dr. Jones: Well the obvious answer is anything to do with Jesus. If you could go back and see him do anything that would be pretty impressive. Renée: Any particular scene in his life you would most want to see? 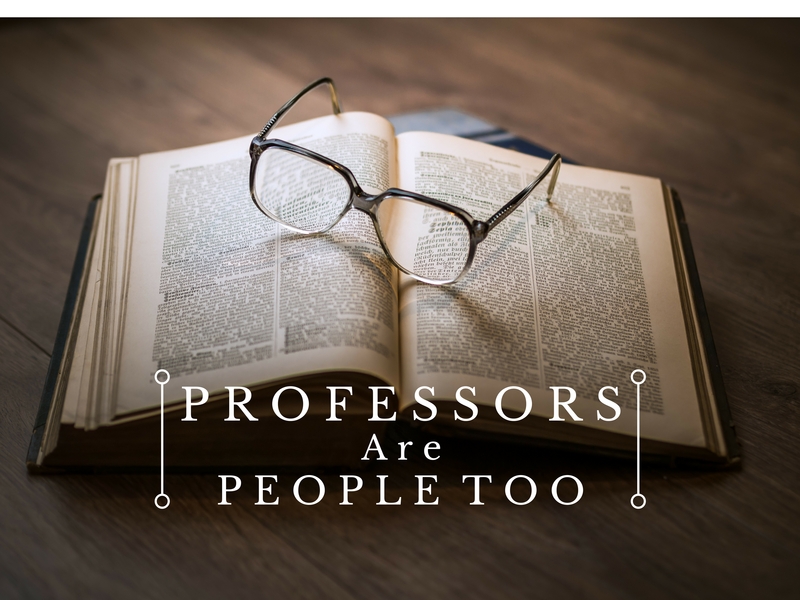 Dr. Jones: So, my background is in social Psychology – how people think about and interact with each other, so I think what would be fascinating would be to watch the disciples while he is talking about anything. It would be fascinating to me to watch them witness and try to process what he’s talking about. Wait no I take that back! There are two other things that just popped into my head. Jesse Owens at the  Olympics. He went to Germany while Hitler was in power. I want to say he won about four medals, but I don’t know off the top of my head. So, there’s this black man from the United States [coming] over to Germany while Hitler is in power and the Nazi stuff is going crazy. This guy goes and beats the pants off them. Another one would be either a rally or maybe even the big speech in D.C. by Martin Luther King, even some of the negative stuff would be fascinating, especially as a social psych person. Speaking to Dr. Jones was just as enlightening and entertaining as his students let on. If you ever have the opportunity to take one of his classes, you should. You may even find out where the cat is… or you could just read the answer to the bonus question below. To this, Dr. Jones rolled his eyes with such intensity, his whole body accompanied them. After a preparatory sigh, he began his non-answer to this ambiguous question. Dr. Jones: The cat, yes. I don’t teach this course, but in physiological psychology and cognitive psychology, they talk about brain physiology and memory processes. I am kind of a weird person; I tend to think very philosophically, even though my degree is in research. I had a question in grad school about how we actually store information in our heads. I understand the models, right? They have little models in books and they have little boxes, arrows, and dot-dot-dot, but that’s not actually in our heads – that’s a little figure, a representation, so we see something we can understand. How does it actually get in there, stay in there, and then get back out? I never got that because if you know anything about brains, it’s all just a bunch of neurons. A neuron is this tiny, tiny, tiny little thing that looks like little string, and it’s not like they’re neatly aligned, they’re just this mass of things in a seemingly unrelated function. Somehow in this mass of string and goo, we have the ability to store information and retrieve it. I was in this cognitive developmental class once with this really brilliant guy, Dr. [inaudible] who had been the head editor of one of the top developmental psych journals. He’s been doing this stuff for 25 years, so I thought, ‘I’ll just ask him.’ I said, ‘So everyone knows the word cat,“c-a-t,” and the reason we know that is because it’s somewhere in your brain, right?’ And he’s like ‘sure,’ and I’m like ‘Ok, so the cat is in there somewhere and we know it’s in there because we can say it and retrieve it and visualize it and everything else.’ So I asked, ‘where is it?’ And he said ‘what do you mean?’ I said, ‘where is the word… what does that look like in all the mass of neutrons? Is there a C somewhere and an A somewhere and a T somewhere and it gets put together, or are all the letters in the same place, or is it some sort of neural code that gets translated into the word cat?’ And do you know the answer to that? Dr. Jones: Would you like to know his answer to that? Renée: Yes, I suppose so. Dr. Jones: “Oh… we don’t know that!” [throws hands in the air and laughs] We don’t know?! Why am I taking all these classes? If we don’t know that, what do we know? That seems pretty simple doesn’t it? And we know none of it.